Abstract. Present-day landscapes have evolved over time through interactions between the prevailing climates and geological settings. Understanding the linkage between spatial patterns of landforms, soils, and vegetation in landscapes and their hydrological response is critical to make quantitative predictions in ungaged basins. Catchment coevolution is a theoretical framework that seeks to formulate hypotheses about the mechanisms and conditions that determine the historical development of catchments and how such evolution affects their hydrological response. In this study, we selected 14 volcanic catchments of different ages (from 0.225 to 82.2 Ma) in Japan. We derived indices of landscape properties (drainage density and slope–area relationship) as well as hydrological response (annual water balance, baseflow index, and flow–duration curves) and examined their relation with catchment age and climate (through the aridity index). We found a significant correlation between drainage density and baseflow index with age, but not with climate. 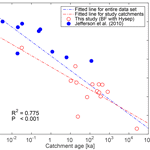 The intra-annual flow variability was also significantly related to catchments age. Younger catchments tended to have lower peak flows and higher low flows, while older catchments exhibited more flashy runoff. The decrease in baseflow with catchment age is consistent with the existing hypothesis that in volcanic landscapes the major flow pathways change over time from deep groundwater flow to shallow subsurface flow. 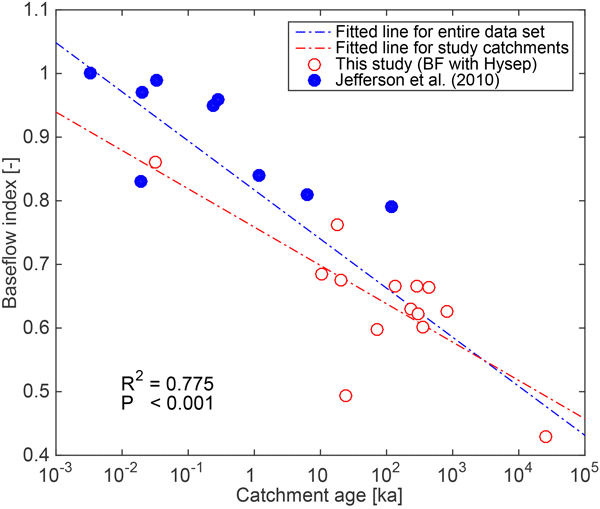 The drainage density of our catchments decreased with age, contrary to previous findings in a set of similar, but younger volcanic catchments in the Oregon Cascades, in which drainage density increased with age. In that case, older catchments were thought to show more landscape incision due to increasing near-surface lateral flow paths. Our results suggests two competing hypotheses on the evolution of drainage density in mature catchments. One is that as catchments continue to age, the hydrologically active channels retreat because less recharge leads to lower average aquifer levels and less baseflow. The other hypothesis is that the active channels do not undergo much surface dissection after the catchments reach maturity. How to cite: Yoshida, T. and Troch, P. A.: Coevolution of volcanic catchments in Japan, Hydrol. Earth Syst. Sci., 20, 1133-1150, https://doi.org/10.5194/hess-20-1133-2016, 2016. We derived indices of landscape properties as well as hydrological response and examined their relation with catchment age and climate. We found significant correlation between drainage density and baseflow index with age, but not with climate. We compared our data with data from volcanic catchments in Oregon and could confirm that baseflow index decreases with time, but also discovered that drainage density seems to stabilize after 2M years, after an initial increase due to landscape incision.